Fig. 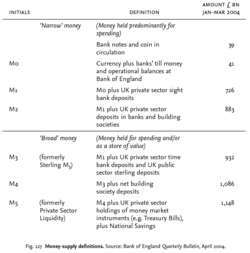 127 Money-supply definitions. Source: Bank of England Quarterly Bulletin, April 2004.
definitions include other assets that are less liquid but are nonetheless important in underpinning spending (for example, many building society deposits have first to be withdrawn and ‘converted’ into notes and coins before they can be spent).